The Brita Slim water filter pitcher is a smart, space-saving design from our inventory of top-selling Brita brand water purifiers at Today’s Concept. You deserve a fresh tasting glass of water every time. 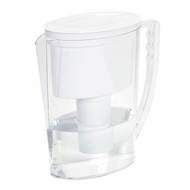 Brita’s Model 42629 Slim drinking water pitcher with filter in the 1.25-quart size will filter five eight-ounce glasses of water each time you fill it. You’ll remove the taste and odor of chlorine while reducing unhealthy levels of contaminants. Feel better with a Brita.